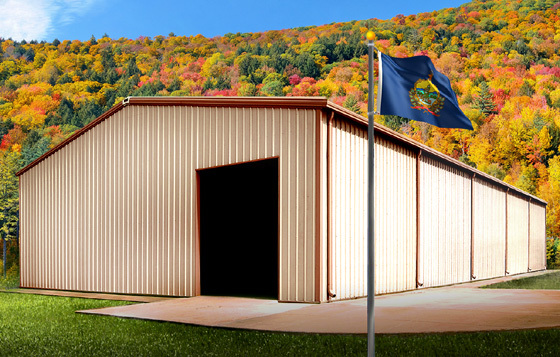 It just makes sense to build structures with prefabricated steel buildings in Vermont. Only pre-engineered metal buildings offer the strength and durability to stand up to the state’s volatile climate extremes. Metal buildings kits create the perfect frames for many commercial and industrial building. Only steel supplies the strength to clear span 300 feet in width or tower 42 feet or more. Widths up to 480 feet are possible with a minimum number of interior supports. And not all steel buildings look like farm structures. You may finish RHINO metal buildings in Vermont with any typical exterior product. Choose brick, stone, stucco, glass, tilt-up concrete panels, or cement board to create the right look for your project. The strength of steel and the pre-engineering of the structure combine to produce a highly stable structure. RHINO steel buildings meet or exceed all current local building codes— for the lifetime of the structure! From a thousand square feet to a million square feet, RHINO Steel Building Systems has the right building at the right price for Vermont building projects. Learn more about the ways RHINO stands out from the common herd of metal building dealers. Call RHINO Steel Building Systems today at 940.383.9566. Ask for a free quote. Receive expert advice on your upcoming building project. We are here to serve you! 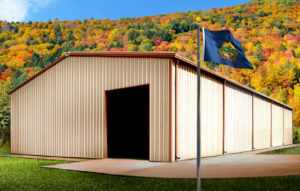 Share the post "3 Reasons to Build Steel Buildings in Vermont"